With lots of innovative devices and wearable gadgets, Apple has now gathered attention from many tech enthusiasts. Apple watches have also become the preferred products to the consumers, though they are used by people for different purposes. Some users like to utilize it as simply a timepiece, while others want to consider it as a kind of workout tracking system. To most of the consumers, Apple Watch involves a very simple or uncomplicated design. However, it turns out to be flashy to some people, while the screen lights up now and then. Whether you’re watching something in a theatre or driving a vehicle, this flickering of Apple Watch is quite disturbing to you. That is why Apple has updated watchOS 3.2 with the addition of a special feature to prevent the issue. Theater Mode is the newest feature, which allows all users to get rid of the problem. While you have activated this mode, the timepiece becomes silent. However, you will be able to access the screen only by tapping or pressing Digital Crown. This type of feature may be compared to flight mode, which you often find in Smartphone. But, it does not interfere with the function of wireless system, though it retains the silence of other things. To say more clearly, the screen of your Apple Watch screen will not get lighted up whenever you are moving around your own hands very frequently. Moreover, you may not hear any sound of notification. But, though notifications will not stop reaching your device, the display area can never flicker. When you have not installed new firmware of Apple, you need to do it instantly. Choose the option- General, and then click on- Software Update. It may allow you to have the new update on your wearable device. Connect your gadget to a source of power and install it. After installing this firmware, you may access Theater Mode option, offered by Apple. In order to have the interface, you need to swipe up the display part to the upward direction from base of the watch. You may instantly have a view of different things, such as, current percentage of battery and different icons (Don’t Disturb). An icon of AirPlay may get shifted towards the bottom part to create a place for Theater Mode. Until a new different icon is seen, you need to keep on scrolling Control Center. 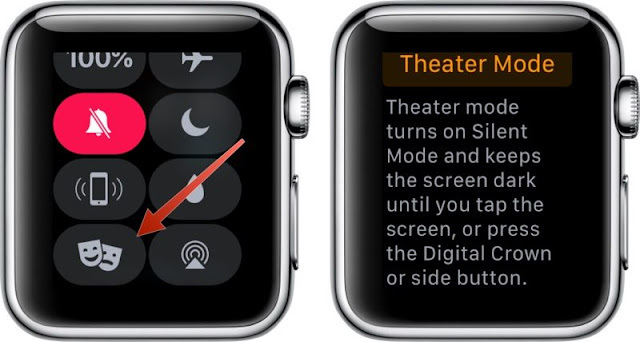 Touch the icon for Theater Mode to get extra information. It lets you know that this mode activates Silent Mode, keeping your display dark. After pressing the button, you will automatically have the benefits from this new mode. No matter, whether you’re lifting up your wrist, its screen may stay dark without causing diversion. Thus, with this few steps, you can make use of Apple smartwatch in your own way. However, if needed, you may also deactivate the function.